Messaging app firm Kik quietly launched its own virtual currency last month, but today it has been a bit more public with an announcement that, while fairly minor in content, has interesting connotations for its future. The Canada-based company has updated its iOS and Android apps to give users more control over how they connect with new contacts. Gone is the old approach that effectively let any user contact anyone with messages and photos off the bat (users could later block irritating people); a new ‘screening’ system effectively mutes messages and media shared by a non-friend until the user explicitly adds the person to their friend list. As the screenshots below show, new messages and images are blurred out until a user taps the green button to accept the new contact. Kik CEO Ted Livingston tells us that, on the face of it, the update means less unwanted attention for users, and more control over who you wish to connect with on the service. There is a deeper meaning here, however, and Livingston explains that this update is the first of many that is aimed at positioning the messaging app — which has 140 million registered users — as a “chat network” for the mobile internet. “We’ve spent some time thinking about what it is that makes Kik unique, and why we are growing,” he explains. 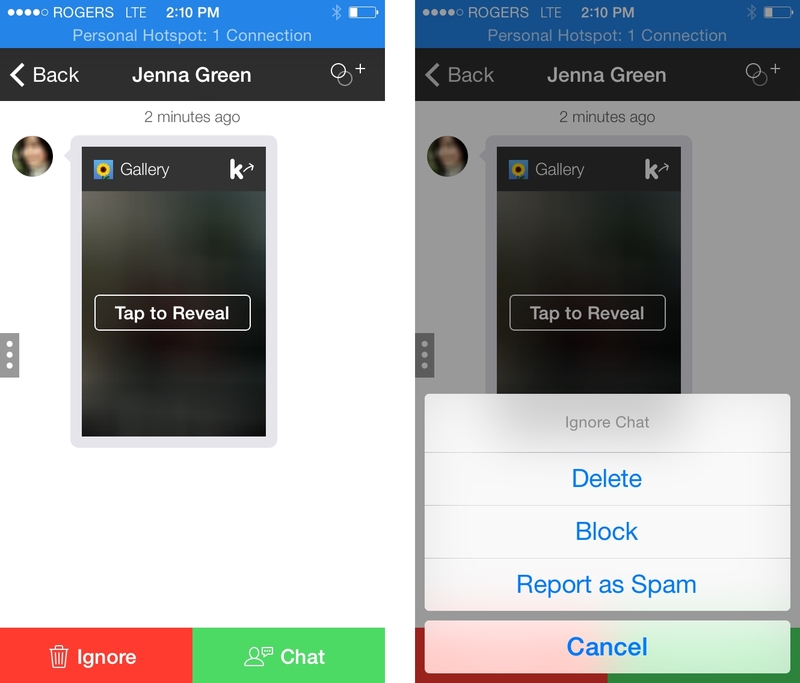 “We’ve been looking to hone in on why we are so different: essentially it is that Kik lets you chat with anyone. “WhatsApp is strictly for friends and family [because it requires a phone number to connect users] which has parallels with Facebook. Twitter, on the other hand, lets you follow and message anyone, and we feel like that is a good comparison for us because you only need a username to connect on Kik,” Livingston says. Kik is adding 275,000 new users per day and has more than quadrupled its user base in the past 18 months, but still the company is still refusing to reveal its active user numbers. Livingston says that much of the growth has come via other services, such as Instagram, where Kik is commonly used for conversations between people that just met or want to continue a conversation. That’s despite Instagram getting its own private messaging feature this year. Kik conversations are as likely to be about business as romance or friendship, according to Livingston, who adds the app is the messenger of choice for many Instagram ‘stars’ who use it to liaise with companies that pay to post advertising in their feeds, for example. Some prominent Instagram users even include their Kik username in their Instagram profile, though details are commonly exchanged in the comments section below photos. “If you want to chat with anyone, we want Kik to be the one app to do that: we want to be the Twitter of chat,” Livingston adds. The Kik founder says that this refocused vision will become clearer soon through other features and updates that are planned for the service. Messaging apps have been a hot topic since Facebook agreed to shell out $19 million on WhatsApp. Kik is competing on an equal footing for the number one spot in the US market, as a recent Distimo report pointed out, which makes the company one to watch out for.